Tennis at Muirfield Village - Muirfield Association, Inc.
Tennis season begins June 3, 2019. The Muirfield Tennis staff is excited to bring the neighborhood a summer of lessons/clinics and tennis events for all ages. 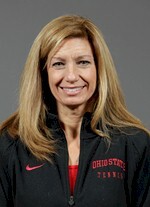 I am pleased to bring back a very experienced staff again to bring the residents a variety of programs to meet your tennis needs. If you have any questions on any of the tennis programs offered, or have a request, please don’t hesitate to ask. See you at the courts! Click a link to get started!